Wow! We just had to share the great news that Firefight is now available for purchase on the FriesenPress website! We’re so excited that Rick’s book is finally reality. We hope you enjoy reading Firefight and would love to hear your thoughts, questions and engage in discussion about any of its content whether about Rick’s tour in Afghanistan, his experiences as a firefighter or his earlier days in Bosnia and with the Airborne Regiment. You can always share here in the comments, or via Twitter: @Firefight2014 or Facebook: Firefight by Rick Kurelo. Thanks so much for your interest in Firefight. Cheers! Firefight is on its way! The creation of Firefight has happened over more than twenty years. My careers as a military soldier and as a civilian firefighter have produced many stories – some exciting, some funny and others that are purely horrifying. What they all have in common is that they actually happened. Throughout the years, I wrote about my experiences in Canada and on the other side of the world. Although I never considered myself a writer, something inside told me that what I was doing was important and that others might enjoy reading about what I had gone through. Recording day-to-day events became part of my life as did telling these stories to my friends and family. Over and over again, people would say, “You should write a book!” and so that’s exactly what I’ve done. Thanks to the support of many, Firefight is about to launch in May of 2014 through FriesenPress. I’m hopeful it will be available in time to help celebrate Canada’s National Day of Honour on May 9. This would be extremely meaningful for me as I served in Afghanistan as a psychological operations specialist in 2008 and 2009, was injured by an IED and then finished my tour following recovery. Upon returning to Canada, I was honoured to be one of the first Canadians to receive the newly created Sacrifice Medal and have also been working my way through PTSD. 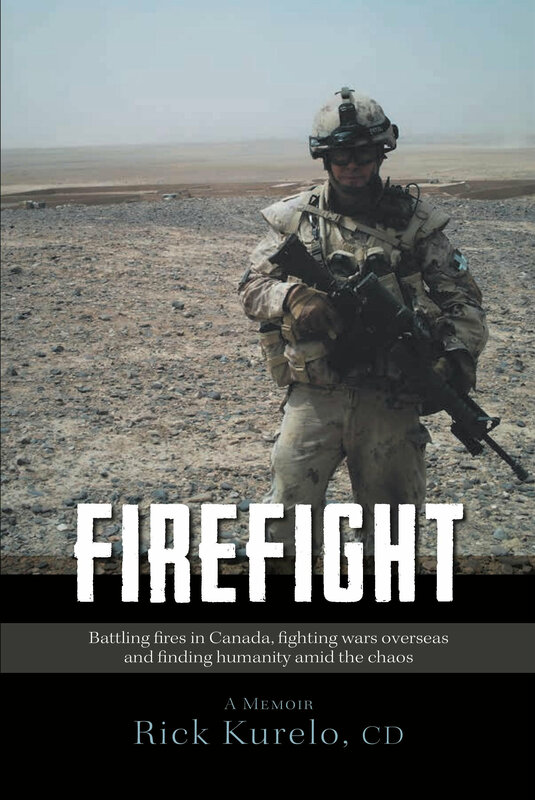 Firefight includes my experiences as a solider with the Canadian Armed Forces and as a firefighter with Oshawa Fire Services. It also includes some description of my life “After Afghanistan,” as I joined Canadian civilian life once again. I’m excited that after all of this time, Firefight will be published soon. I hope that everyone who reads it will discover something that speaks to them – whether they’re a fellow soldier, firefighter or reader exploring life in the line of fire.